A cheerleader's job involves more than tumbling and cheers. 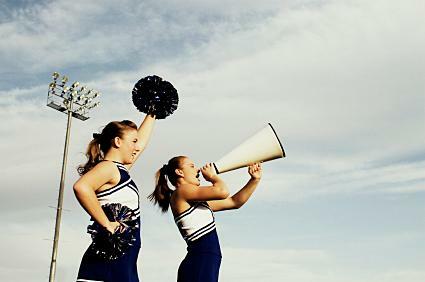 Cheerleaders also play a role in boosting a school's spirit. School spirit events can help all students feel like they belong and are contributing the the school's success. Think beyond sporting events to come up with ways to get every student involved in supporting the school. Start with some of these school spirit ideas and then use your own creativity to come up with new ones. Heavy advertising is the key to a successful spirit week. Finalize all of the spirit week events at least two weeks in advance and begin hanging posters advertising spirit week around the school. The week before, start reminding students to participate over the morning announcements or the school news show. The more you get students and teachers talking about spirit week, the more likely they are to actually participate in the events you plan. Planning a pep rally does not require a lot of advance preparation, but teachers and other school staff will want to know a week or two in advance so they can plan accordingly. Some schools ring a victory bell after every win or hold an annual student-staff volleyball game. Others have an ice cream social or a picnic on the last day of school. It's never too late to start your own school tradition and give students something to look forward to after every win, every quarter, or once a year. A simple tradition, such as ending the announcements the day of a big game with the school fight song, does not require a lot of planning or effort, while a more complex tradition, such as an annual back-to-school carnival, will require months of planning, fundraising and a lot of student and community volunteers. School dances give students a chance to let their hair down and have a little fun. 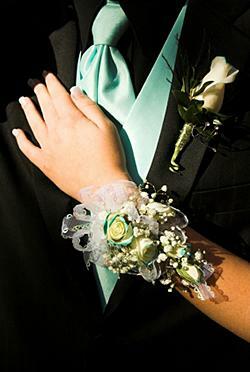 Every school dance does not have to be prom-quality or require students to dress up. In fact, a casual dance on a Friday night may attract more students than a fancy affair. All you need for a school dance is a place to dance, a DJ and some adult chaperones. You can sell tickets to help pay for other events or use the dance as a reward for academic excellence or another accomplishment. Whatever you decide, a dance gives students a safe place to hang out during the evening and a chance to mingle with one another. Work with school staff to make sure that all safety regulations are adhered to and that the requisite number of chaperones will be present for the dance. You'll also want to ensure you have a committee of volunteers willing to help clean up after the dance is over. Just as family dinners can bring a family closer together, school dinners can bring a school family closer together. Hold monthly or quarterly dinners where students and their families can pay a small fee and have dinner at the school. The proceeds from the dinners can be used to cover the cost of future dinners or to help support upcoming events. During the dinner, have performances by students in the band or drama club or invite local businesses to set up tables to advertise. A school dinner must be planned at least a month in advance to make sure you have time to purchase all of the supplies and gather enough volunteers to help cook. Simple dinners such as spaghetti or hot dogs and chips are inexpensive and easy to prepare. Contact local merchants to see if they will help by donating a portion of the food, beverages, and supplies needed for the event. Spirit Line sells a ton of spirit gear options for your school, including temporary tattoos, car gear and spirit packs. The company also designs fundraisers to help schools profit off of their spirit gear sales and has some of the lowest prices. SpiritGear lets you design your own t-shirts, gifts and glassware. You can include your school's logo or special images. The gear may also be personalized to appeal to specific clubs, organizations or school events. MyLocker is another option for creating customized spirit gear. Through the website you can create a shop for your school and earn commissions whenever products are purchased online. Instead of selling items in the school, parents and students can order spirit gear online and have it shipped directly to their homes. This allows you to offer more designs and avoids the hassle of handling money or keeping track of orders. While a cheerleader's job is to bolster school spirit, you do not have to do it alone. In fact, getting non-cheerleaders involved in planning events designed to improve school spirit will help improve the success of your events. 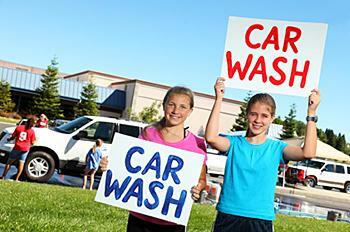 Form a school spirit club, full of students who want to volunteer to help with school events. Partner with other school teams, clubs, and student council to get their help with planning and sponsoring events. The more types of students involved in planning, the easier it will be to spread the word and get a good turnout at all of your festivities.